1. Focus on the little things: Everyone seems to focus on the big aspects of an adventure. We need gear, fitness, and such but it is often the little things - often routine things - that interfere with our success. 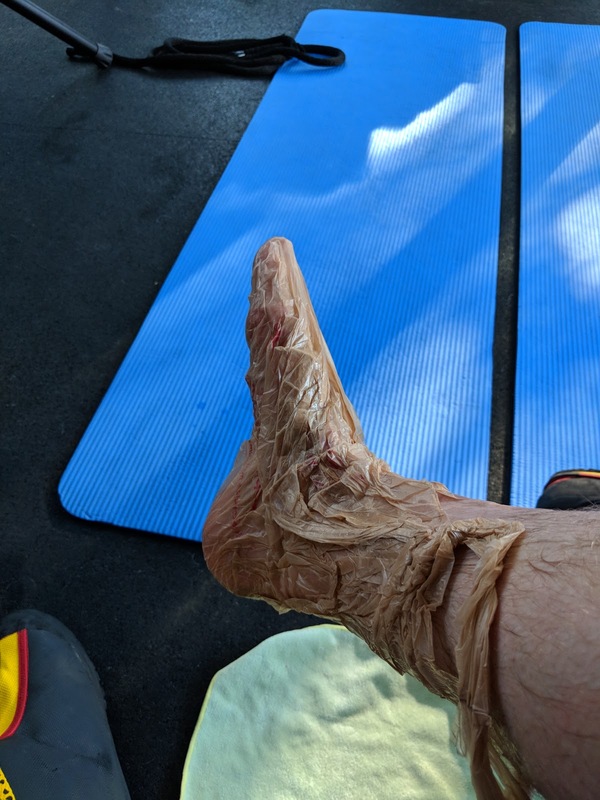 Many forget to train themselves to go to the bathroom without making a mess, to change clothes quickly without much light to help guide the way, to organize your gear so everything can be found easily, and to eliminate any obstacle that interferes with optimal performance. I try to train for all these little things (and many more) while at home. I create checklists that I affix to the inside of my bags to eliminate any cognitive load while packing between camp sites. These small steps help me immerse myself in the environment well before I even step on the mountain. 2. Prepare for every scenario: In most adventure sports, the odd scenarios are the ones that are most dangerous. I try to the best of my abilities to prepare for both the good and the bad. What happens if....and I think of contingency plans. 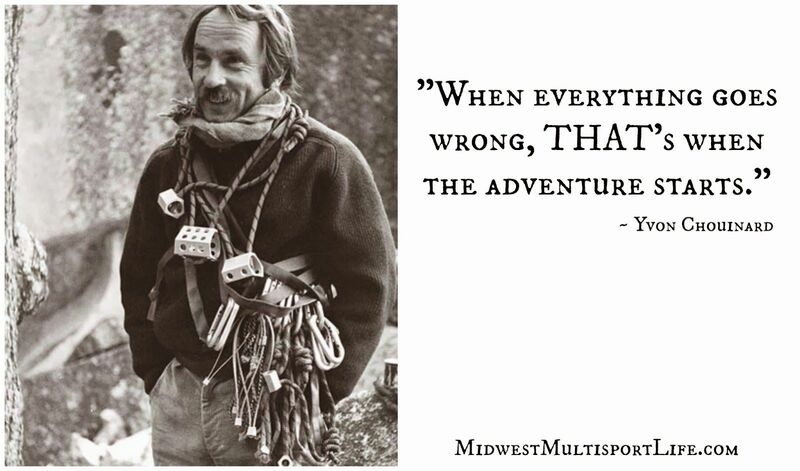 As Yvon Chouinard (the founder of Patagonia) said "[t]he word adventure has gotten overused. For me, when everything goes wrong - that's when adventure starts." We can all prepare a bit for the adventure though. If we let everything unfold without much preparation, then we might find ourselves in adventures where and when none should exist. 3. Focus on the process - not the outcome: I find more enlightenment in the process and experience of the outdoors and of adventure rather than the attainment of some goal within that environment. You may differ from me but I think most of us who go outside, stress ourselves, and come away wanting more are those who enjoy the process. I like the stress. I like the preparation. I like the discomfort. I embrace it all. 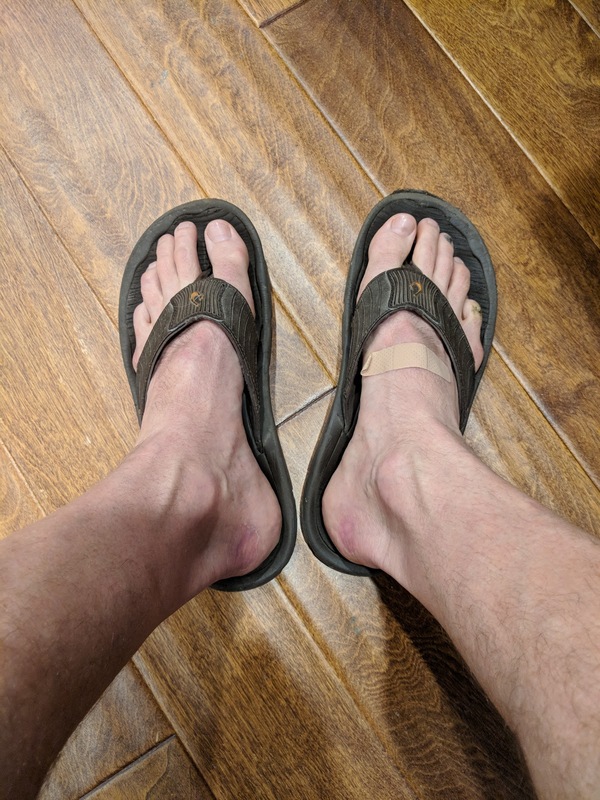 Each of my adventures includes all and more but I find the most memorable aspects of every adventure are those that involve the struggle - not the culmination of the effort. Sure, I celebrate the end but I live in the moment and enjoy every step, stroke, or surge forward. 4. Eliminate surprises: Most surprises come from inside - not outside of us. If you know yourself and know how you will fare in every situation, you can both prepare yourself but more importantly you can prepare your mind. I try to eliminate surprises to the best of my ability by experiencing the stress and strain of every adventure BEFORE I depart. I start from my feet and move upward to the top of my head. 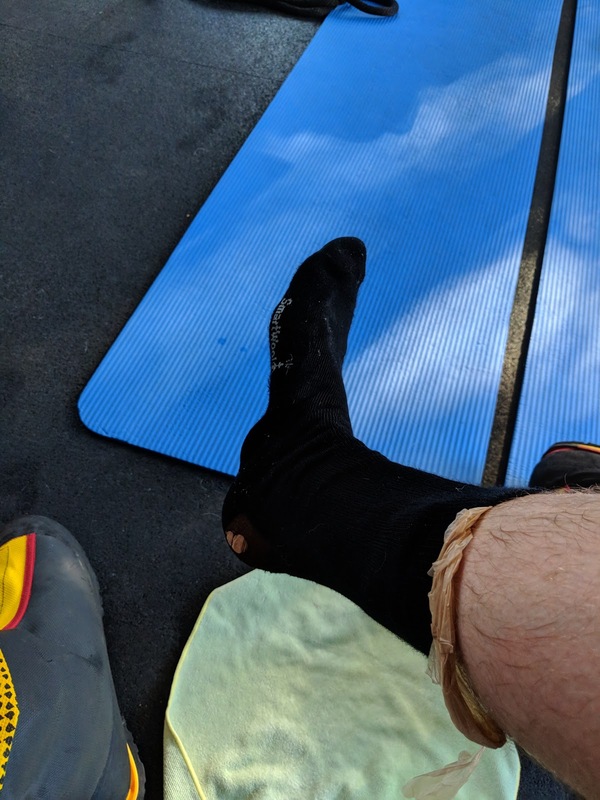 What can my feet withstand? Apparently not much these days. Then, my legs; how do they fare after long days? Can they withstand more stress after 3 or 4 days of hard slogging? Eventually I move up to my head. What does it feel like to be truly tired? How does it feel to be exhausted, dehydrated, malnourished, or spent (all combined)? I like to feel and know how I react before I leave so I can also learn how to prevent these situations from occurring. It is one thing to say that you know how you feel but it is another to say that I both know how I feel in those situations and I know how important it is for me to prevent them (and here is how...). These four steps served me well over the past few decades. Thanks for following my adventures. Hope you have a lovely day. My climbing partner - Brendan Madden - and I were chatting recently about immersing ourselves into the climb. We both watch YouTube videos pertinent to the Tibet side Everest climb. For those interested in seeing two that provide a ton of detail, we recommend Li-Lan Cheng's video and the Everest No Filter: A SportsCenter Special video. Both videos offer a clear glimpse of all the camps, terrain between camps, and general climbing conditions. I think I speak for both of us when I say that watching these repeatedly gives us a wonderful vision of what we can expect. Speaking of expectations, we are dutifully documenting our gear and needs by camp throughout the climb. I create checklists that I later print out to save me from having to remember or scramble for gear when I am least capable. A simple checklist enables me to operate mindlessly on most of the climb. Yes, you could say I am a planner but the best laid plans often go haywire...and that is when the adventure begins. The difficult part of planning the climb is determining when the summit push occurs. As I mentioned above, the itinerary is a rough sketch. We have no idea if the mountain will allow us to climb on the day we aim to summit. 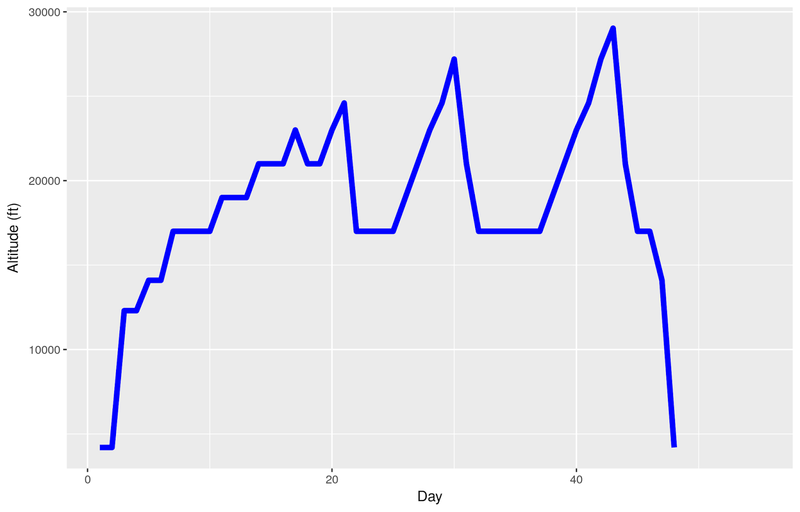 Instead, we have data to consult - the Himalayan Database. Richard Salisbury and Elizabeth Hawley cobbled together records from thousands of climbs and climbers over the years. The data are now available for all - thanks to the sponsorship by the American Alpine Club. 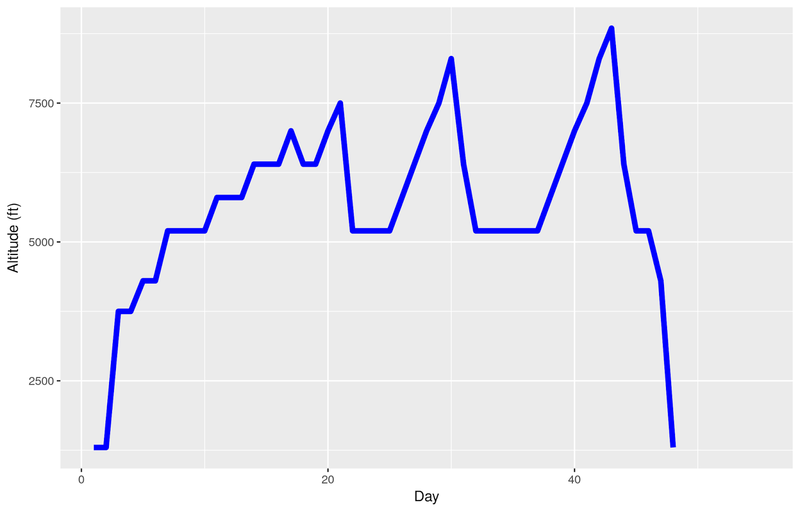 I read the data into my favorite statistics program (R) and plotted the days in May where successful summits occurred (on either side). The results are quite surprising. Below is a figure that represents the day in May (why May? Because that is the most likely month to summit Everest). The figure shows that the mean summit day falls on May 21st (20.69 for those who are interested in minutiae). 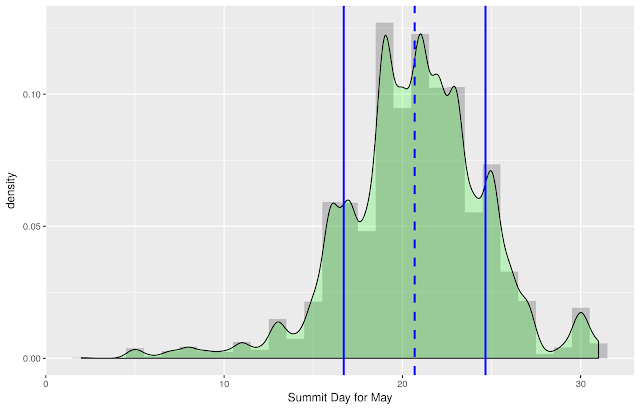 That date - plus or minus 1 standard deviation (often represented as +/- SD) gives us an expected summit window from historical records (since 2000) of May 17th through May 25th. Why did I restrict my search to 2000 and later? The climbing structure for both sides differed over the years. Each side's mountaineering oversight changed until the local authorities started implementing more of a standard routine at or about the year 2000. Historians may differ on my cut-off but I am not producing this for historical purposes; I want to get a "best guess" on a summit window. So, sometime in mid to late May, we might be fortunate enough to summit Everest. Our planning and preparation continue. We aim to winnow down our gear to what we "need" and when we might find it useful. More on that process later. Speaking of needs....I need to get my day going. Rest days are not always restful! Thanks for following. 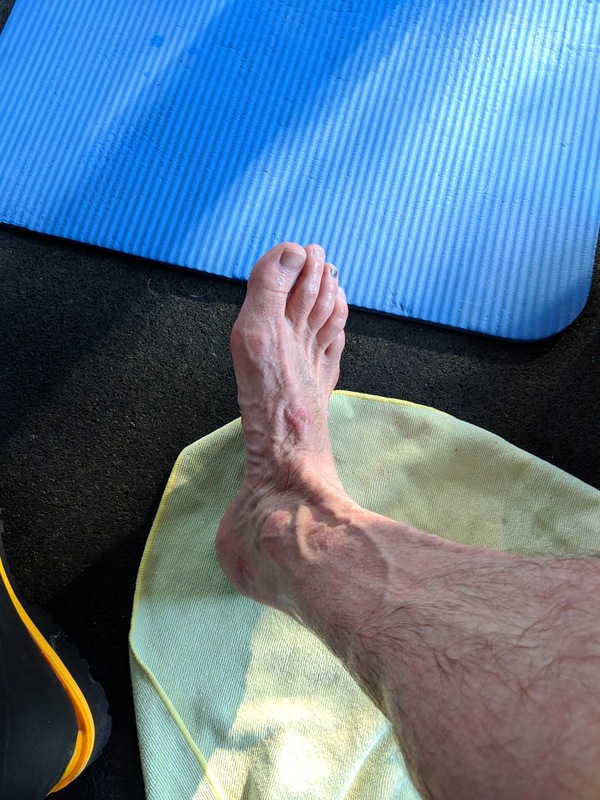 Expect another update on my next rest day - this upcoming Wednesday (1/31/18). See you soon. Have a lovely weekend. That momentum I thought I had for future posts went out the window as I wrapped up a busy semester. Once the semester ended, I headed up to the Pacific Northwest (the states of Washington and Oregon in the US for those of you from far away). I skied and skinned with my pals and they taught me a thing or two about youth (don't waste it). Today (Tuesday) marked a milestone where I both began training again in earnest after skiing during the holidays. Finally, I felt good enough to train after suffering from 3 sinus infections. Ah...all is good now. So, 90 more days until I will be in Kathmandu (as of January 9th). Here is what I can offer as an update. 1. I am physically fit to leave today. So if I am fit already, why continue to train? Over the next three months, I plan to lose a few pounds to make climbing a wee bit easier, break in some new(er) gear while staying fit, and implement a few training changes to put the finishing touches on what I believe is shaping up to be another great preparation. I am fit to climb today but I have some minor details to iron out. 2. I keep learning with each adventure. 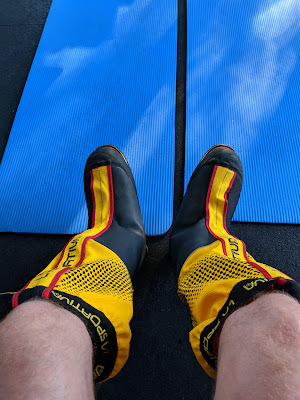 My first Everest preparation focused a fair bit on training. I found that fitness was only one aspect of alpinism and a very small part. In preparation for my second Everest expedition, I focused more on hypoxic training AND fitness. Together, these two approaches provided me with sufficient stamina to reach Everest basecamp in a day and a half (well short of the 5 days it took us in 2014). Still, I thought I could do better. For my third time (and final attempt), I am combining the two previous bits with another approach - get hardier. I figure being fit, acclimatized, and hardy gives me the best shot of tolerating anything. 3. Hardiness training comes easier than I thought. Preparing for marathon swimming gave me insights into how training leads to better tolerance for extreme environments. Specifically, I learned to tolerate cold water by simply immersing myself in cold water, cold air, and warming up naturally. I now vary my diet, eat simple foods, and push myself to be uncomfortable. Every day, I take cold showers to develop better cold tolerance. These efforts are easy and enjoyable. You can say what you want but after a while, I find comforts to be uncomfortable. 4. Weight training takes priority over cardio training this time around. I found that too much cardio training lead me to lose muscle mass. Rather than push my time running, and working out on the elliptical and bike to build my cardiovascular fitness, I now focus more on weight training to maintain my strength. I focus on legs more than upper body but I cannot let my upper body go to pot. Upon my return from Everest, I have a month to recuperate and then I head back to Ireland for more marathon swimming in Cork (hi to my Cork Distance Week friends). So, I hope to remain strong throughout the entire preparation. 5. My plans are shaping up. I leave on April 5th for Kathmandu. More details to follow.